This Kettler Scooter is awesome! My kids absolutely love it! First of all this is probably the easiest kids toy I've ever put together and requires no tools. I love that the handle bars are adjustable which comes in handy since my 3 girls are sharing it. The handle bars are also easy to adjust which is nice since we will be adjusting them so often. It's very stable and easy for all three of my girls to use. I also love that it has a foot break which makes stopping a breeze. 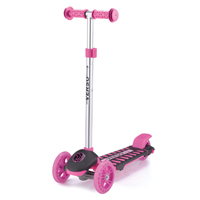 This is seriously such a fun scooter and would make a wonderful gift this holiday season! Use code FIT&FULL20 for 20% off your purchase site wide. Click HERE to find a store near you that sells Kettler USA products! Click HERE to learn more about Kettler USA! Follow Kettler USA on social media! This scooter has been on my list for a while now! Every time I'm about to buy it I start worrying about accidents. What's your experience so far? No crazy falls?! Nope! I was really worried about my kids falling too but it's been great. I think it much safer than a few other scooters we were considering. We love it and the kids have no problems getting around on it. If you use the code about you get 20% off. I think it might be site wide so it should be able to be used on anything. This would be an excellent gift for almost any kid. Pretty awesome! How fun! I loved my scooter growing up! My little boy would have too much fun on this! That looks like a really fun scooter!!! Wow this is a unique set up! I bet it's really sturdy compared to other models! Thanks so much for the review. I will share it with those purchasing scooters! That looks so fun! The twins have been asking for this for Christmas. I will check this out. My daughter looooves her scooter. I wish ours had been as easy to put together as this one! All of my kids have loved having scooters! They are also so easy to throw into a car for trips and the kids take them on vacations. I remember my kids having a scooters!!! They had so much fun riding them. How fun is this?! My daughter would love it! Looks like scooters will be another hot item on this year's Christmas lists. This one looks like a great option. Omg what a great scooter!! I have a 3 year old little girl who would love it if Santa brought her one of these! ahhhh I love scooters! My daughter has had one her whole life & she loves them! We are actually checking out scooters as a christmas present for the little one, perfect timing! This would be so much fun for my son for this Christmas! We had one similar to this when my daughter was younger. Great product! I bet my sons would love something like this! i need to look at it for Christmas this year! OH MY WORD. My kids want a scooter. It is such a fun thing to have, but golly just so afraid they will hurt themselves.